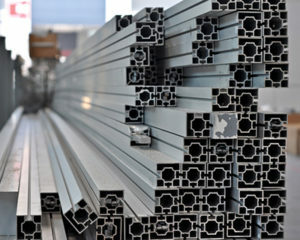 Freiborne's Precoat 1 Helps Aluminum Bottle Manufacturer Save $350k Annually. 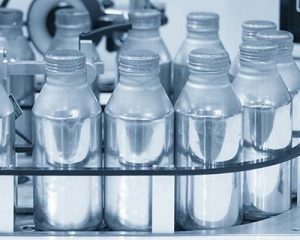 An aluminum cold forming operation producing medical bottles was expensing an average $2.28 for tooling costs per drawn part. In addition to the cost, they were also experiencing inconsistent part quality. With 200,000 parts produced annually, the total annual cost of tooling expense was over $450,000. 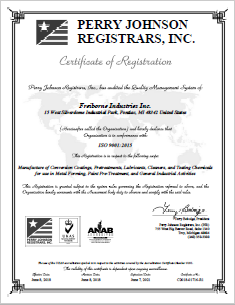 In order to decrease cost and quality inconsistencies, the company reached out to Freiborne Industries. Freiborne suggested they replace the competitive material in their immersion coating line with Precoat 1 technology. This resulted in the cost being dramatically reduced to an average expense of only $0.45 per part. This resulted in an annual savings of over $350,000. The conventional process using the incumbent’s formula often lost a significant amount of precoat weight after the neutralizer immersion. Associated with the deposition loss, the regular result was lack of uniformity of the lubricant coating following the application. This lead to poor die life and quality issues. When using Precoat 1 from Freiborne, the result was virtually no weight loss after the neutralizer and uniformity of the lubricant deposition, two critical factors in aluminum drawing part quality and die life. In an effort to provide a cleaner, easier to use, and more cost effective corrosion inhibitor, Freiborne developed the FreiGuard 313 corrosion inhibitor. The Freiguard 313 is an excellent replacement for traditional water emulsifiable corrosion inhibitors. FreiGuard 313 triples the typical corrosion inhibitor bath life and reduces waste treatment costs associated with corrosion inhibitor tanks. Because it is water-based and produces no oil dripping on the floor, FreiGuard 313 provides a cleaner work environment. This also results in a 75 percent reduction in tank cleanout time and a lower cost of operation. 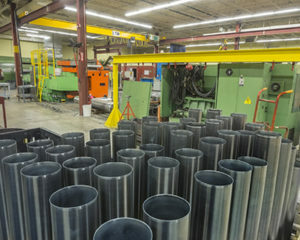 A cold forming operation was using a percholorethylene and wax combination as a lubricant over a conversion coating for numerous aluminum forming applications. The costs of using this type of lubricant layer were excessively high due to the highly regulated nature of the perchloroethylene solvent and high scrap rates. This stemmed from difficulty in controlling the consistency of the solvent/wax lubricant coating. Freiborne developed the Formlube 407 as a water-based lubricant replacement for the perchloroethylene/wax combination. When used over Freiborne’s Formcoat 7 conversion coating, the Formlube 407 was capable of providing the lubrication needed for the difficult-to-severe forming applications. Applied over shot blasted or bare aluminum, the Formlube 407 lubricant will perform in light-to-medium duty extrusions without the need for the Formcoat 7 conversion coating. Implementing Formlube 407 over wax combination lubricants resulted in a reduction of labor costs and number of steps in production. It also eliminated the highly-regulated perchloroethylene solvent from the equation, reduced scrap rates and increased tool life. Flash corrosion is a severe problem that plagues many water-borne-type pretreatment lines. Flash corrosion, or flash rust, occurs quickly when thin water films reside on metal surfaces, which triggers the corrosive action. A secondary process is then required to remove this oxidation, which increases processing time and cost, while reducing production. 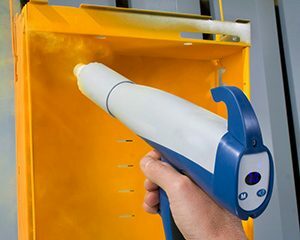 To combat flash rust, Freiborne has developed the Freibond T200 to provide a single chemical paint pretreatment solution. This prevents flash rust, saves the manufacturer time and money, and increases productivity.